Nae a single feaither mentioned. You two may benefit from reading the first post of this thread, again. 50 pages in... I think we've pretty much settled this thread into it's own little niche, which happens to happily reflect the thread title. Exactly. That niche is not just reporting on dino feathers, though. Hey, whatever fluffs yer feathers, but still seems the paleontology thread is the best place for general paleontology articles/news, though. Theropoda, meaning "wild beast" in ancient Greek, is an order of dinosaurs including species like the famous Tyrannosaurus rex. Older cousins of this beast were found on Skye. Originally carnivorous, some theropods evolved to become herbivores, omnivores and even insectivores. Most theropod lineages, scientists think, had feathers in some form or another. 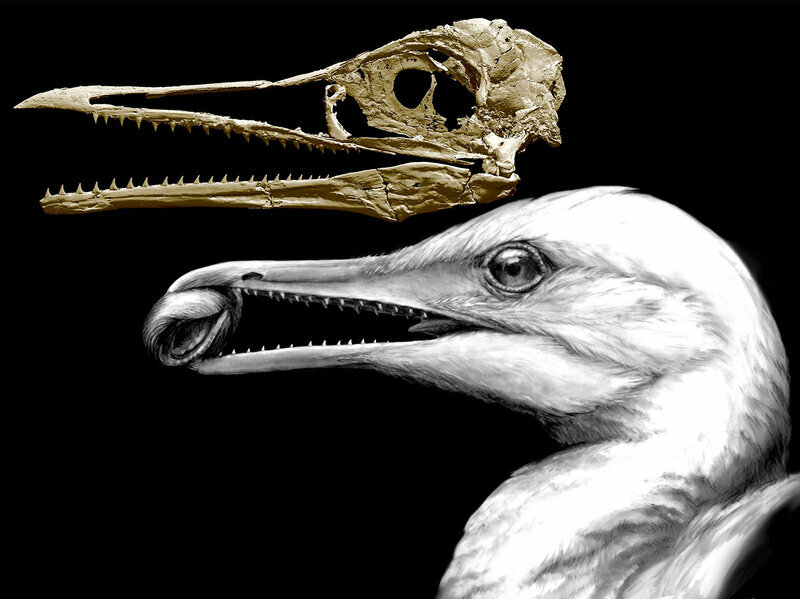 Birds evolved from certain small theropods and coelurosauria during the Jurassic period. The title is kinda like "How Did Men Lose Their Fins And Get Their Hands? ", innit? It's really hard to fault the reporters, but I still fault them. The findings stem from the first-ever detailed study of tyrannosaur skin, done in an effort to determine what role feathers might have played in dinosaur evolution. “I think it’s been a tantalizing option for people to assume T. rex had feathers,” said Dr. Phil Bell, paleontologist at Australia’s University of New England, who led the new study. The results of Bell’s study showed that feathers apparently vanished between two big boosts in body size during the evolution of tyrannosaurids. a new study has found that Tyrannosaurus, and many other large carnivores of the Cretaceous, were likely covered only in scales. 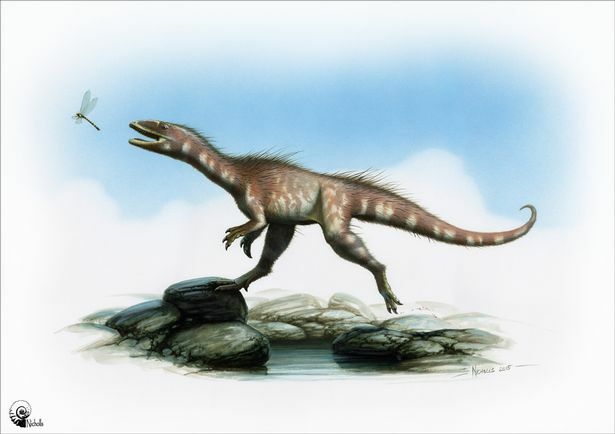 In the first boost, more than 130 million years ago in what’s now China, early tyrannosaurs began to grow long and tall — such as the 9-meter-long Yutyrannus — but they retained the feathers that their smaller theropod predecessors had. But when tyrannosaurids bulked up in size again, this time in Western North America 20 million years later, those features disappeared. 2) I like how the paleontologist recognizes the feather overreach, noting "it became very vogue to splash feathers onto everything in sight". That's a refreshing observation from an evolutionist in the media. 3) I can't read the full scientific paper because it seems it's locked behind a paywall or a membership login, but I'm interested in what kind of conclusions they'd make regarding the T. Rex actually losing it's fuzz and what that means for their theory that dinosaurs evolved into birds. Did the T. Rex devolve at some point, regaining the fuzz that evolution took away? It seems a little counter-intuitive (though hardly insurmountable I'm quite sure) to the dino to birds theory. 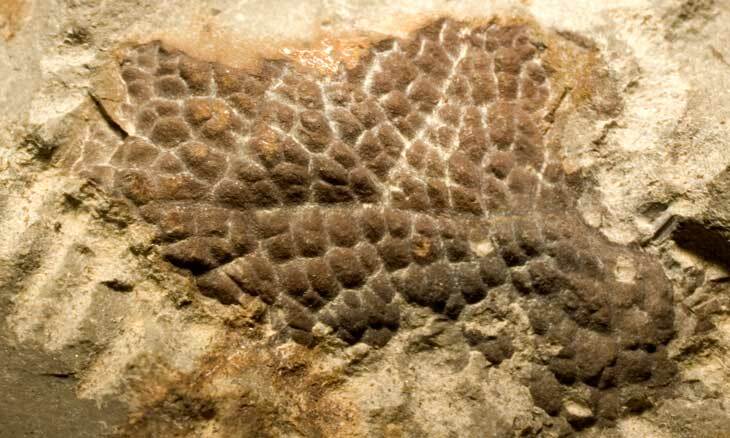 I don't know the specifics but soft tissues like skin are exceptionally rare in fossil form. And even here they're drawing conclusions about the entire animal from a single patch of skin. A lot of the hype comes from the media and artists moreso than the scientists, but yes it's always good to be reminded that its hype. 3) I can't read the full scientific paper because it seems it's locked behind a paywall or a membership login, but I'm interested in what kind of conclusions they'd make regarding the T. Rex actually losing it's fuzz and what that means for their theory that dinosaurs evolved into birds. It doesn't mean anything to the theory of bird origins unless someone has claimed that T Rex is a direct ancestor of some birds, which I've never heard. What we do hear is things like "T Rex's closest living relative is the chicken". That doesn't mean chickens are descendants of T Rex, more like that they are cousins, a hundred million times removed. The same way you and me and Harambe are (very) distant cousins. Did the T. Rex devolve at some point, regaining the fuzz that evolution took away? It seems a little counter-intuitive (though hardly insurmountable I'm quite sure) to the dino to birds theory. I can't remember the examples offhand, but there are cases of lost features evolving again. This is not "devolution", just evolution working within the ever-changing environment. There was more than just a single patch. It might not have been reported in the article I linked but they have samples from stomach, chest, neck, pelvis, and tail. I get that concept...but we're not told, in the same way, that men are gorillas. In fact, that's considered racist. Evolutionists mock creationists who use terminology like "man from monkeys", but they use "birds from dinosaurs" all the live long day. Scratch that, they don't even say 'from' they say 'are'! We're told repeatedly that birds are dinosaurs. This is more to the point of what I was saying. He even uses T. Rex as the starting point, then saying "first bipedal locomotion, then feathers," then, etc... When T. Rex had feathers as a theory, it was put forward as evidence. You never read or see anything discussing birds and dinosaurs being descended from a common ancestor. You always read that birds are "modern day dinosaurs". It's almost an inevitability in popular articles. I get that there's a bit of media hype (how flippin easy and attractive it is to write a T. Rex is a Chicken headline!? ), but there's also a need to keep pushing the narrative, facts be damned in the public square. If we have to say a T. Rex is a chicken to get people to understand our theory, then by the unprovable God we're gonna do it! Dinosaurs are finger licken good! ...as I suspected, it doesn't throw a monkey wrench into evolution's narrative. "Dinosaur" is a very broad term. In taxonomic terms it's probably roughly equivalent to "mammal" or "primate". So birds are dinosaurs in the same way that Humans are primates. Primates include us, the apes, the monkeys, the lemurs, and some other less common families. Wikipedia wrote: Birds are classified as belonging to the subgroup Maniraptora, which are coelurosaurs, which are theropods, which are saurischians, which are dinosaurs. When creationists say "man from monkeys" they are (generally) creating a straw man to either mock scientists for being foolish, or as a dogwhistle for people to be offended that we're being lumped in with lesser creatures. I'll just chalk this up to sloppy writing causing misinterpretation. T Rex is mentioned only as an example of what didn't happen, the rest of the quote refers to "dinosaurs" generally. There's an implicit shift halfway through the first sentence that you missed. Many dinosaurs were bipedal long before T Rex. I heard it was on a Tuesday afternoon, but I have no proof that is true. That's fair. I, admittedly, am not working on the same assumption. Though I do think of "Dinosaur" broadly, as I do "Primate", I don't think of it as say, "mammal" and definitely don't include birds under that umbrella (just as I wouldn't include Man under the Primate category). That's not to say I don't see what you're saying. I do, but I wasn't thinking that way in my previous comments. Oh, I didn't miss the shift, but I was pointing out the sloppy way he spoke because I don't think it's just a random bit of sloppiness, but sloppiness on account of trying to keep things simple in order to fit the narrative. Sloppy, like creationists do when they say "man from monkey", that is, they know better but want as much zing as they can muster. Certainly not holding my breath! I'm convinced that there is no evidence that an evolutionist cannot cram into the evolutionist narrative. It's a thing of beauty really. Nothing can disprove the theory because the narrative doesn't allow any room for other opinions. Neither does creationism, mind you. That's the advantage (and if you're wrong, the curse) of having a really good narrative. Ultimately this is what burns the biscuits of creationists so much. We are supposed to be the pinnacle of God's special creation, uniquely imbued with His image out of all the things he made, formed from the clay by the master artist himself. The suggestion that we came from, that we in some essential way still are "primates" is therefore highly offensive. There's some kind of crisis of worldview involved in accepting evolution if you come from a religious upbringing. I went through it myself a long time ago. If the Creationist narrative is wrong, as it clearly is in the most literal sense, then probably the rest of what I was taught in church is wrong too. That's a heavy thing to wrestle with and it's no surprise to me that most people knee jerk one way or the other. Ok, but why is evolution such a good narrative? What does it tell us? What does Creationism tell us? They don't have to be mutually exclusive. IMO a more beautiful picture emerges when you find a way to hold on to them both. Not sure what makes this so surprising other than the dumbass AP reporter calling them amphibians. There are still however “problems” for certain theological schools of thought in allowing evolution. Pretty much this will be a crisis to overcome even if belief in God remains. Many groups, especially those who believe in Biblical inherency will have trouble with it. Even many other traditions have little to no room for evolution within their theological framework, which nevertheless makes it very hard to believe both narratives because both do speak of the physical world and describe very different worlds indeed! We’ve been around this block many times before. The core of Aquinas’ argument, greatly simplified, is that there is no necessay contradiction between reason and canonical narratives, between science and the Bible. For most worldwide Christian believers, for the majority of Christian theologians (in both Pre- and Post-Reformation traditions) worldwide, this particular problem has long since ceased to occupy center stage. For atheists, for those who attack Christian belief, its resurrection and the passion with which the matter continues to be debated by the few provides both ammunition and succor. They love pointing to this debate and insisting that you cannot be both educated and a Christian believer. I know this post may annoy a few whose theology has been formed within one of those Christian traditions where the question continues to possess great importance. For that, I apologize. Last week my mother-in-law stayed with us. She’s a charismatic Evangelical. My oldest son asked me a question about human evolution while she sat nearby listening. I began to explain in detail the latest theories concerning his question. As I was doing this, my MIL was shaking her head “no” while my son was trying to listen to me. Strike one. Later that day, she informed my son that God created Adam and Eve Instantly and fully human in the Garden. In a literalist sense of course and that evolution was “wrong” basically countering everything else they’ve been taught. Strike two. I decided not to say a word to her undermining me like that. Why? Because my kids, both of them are convinced that their grandma is a sweet crazy old lady and this just proves it again. This is where the rubber hits the road. Seriously, if your doctrine doesn’t allow for the evolution of man, it’s time to evolve your doctrine.